Square’s Order ahead app (and their deprecated Wallet) humanize transactions by supplying the merchant with my name and photo. Made me always feel like a regular when, with Wallet enabled, I could just order my coffee and have the person on register say “Thanks Hunter, you’re all taken care of!” Especially with smaller local merchants, the ability to create intimacy and relationship is a competitive advantage against chain stores and online retailers. Jack Dorsey has also spoken at length about redesigning the receipt to be something more useful, which you already see in play with the merchant feedback survey (smile or frown). So I’ve always found it a bit surprising that Square focuses on the merchant identity but not the employee who actually helped me. Maybe it’s their roots as a tool for sole proprietorships where the two are one in the same, but with the example from Four Barrel below why doesn’t it tell me the Barista’s name? Get individual employees to create their own profile/bio and let me know that “Paul” hopes I had a great coffee. That Paul’s favorite band is NOFX. And that Paul’s appreciates my dollar tip because he’s currently working his way through a Master’s degree. A real chance to turn the employee into a person. In general it’s my belief the PoS/electronic currency mediums of the future will do a better job of making it feel like people are transacting with one another. Not just two electronic machines exchanging currency for goods or services. 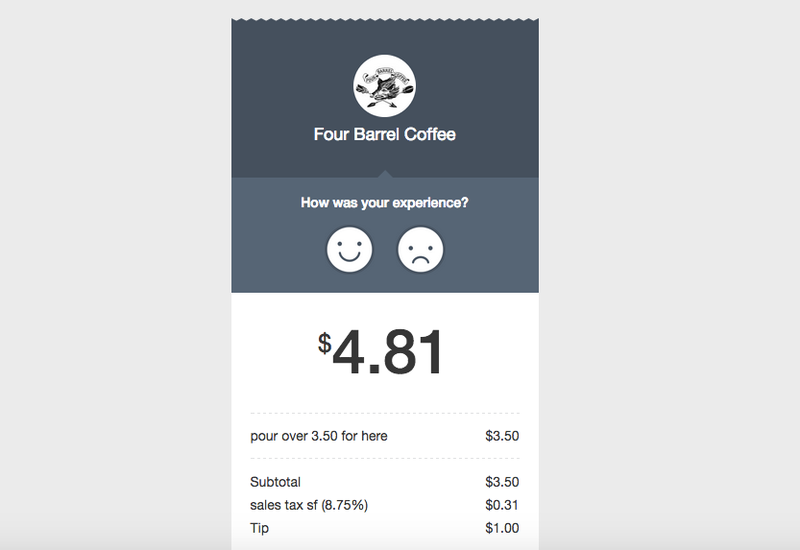 Any retail PoS systems doing this in interesting ways (Venmo’s social feed is an example in p2p)? Any downside for Square or others (besides just potential low prioritization among a long roadmap)?